That yarn looks sooo yummy! Cant wait to see the progress. It’s official now. No turning back. Pardon me while I drool over the Yorkshire Tweed. Can’t wait to see the jacket! I’m really looking forward to seeing your progress on the this project. I’ve wanted to knit an adult version on this when I saw your baby version finished! How very cool. I’ excited to see where you two take it! There’s a linear, uncluttered, Shaker-ish, (Japanese even?) perfection to your projects. And who wouldn’t want to dress like a gnome? Adrian, you and Jared are an inspiration to knitters everywhere! Oh, I love that Rowan yarn – made some really nice slippers with it. Have fun making Tomten. oh, I love the tweed! Just seeing it makes me think of crisp fall days, apple pie, and Rhinebeck! Those are going to be some cute jackets. Actually my daughter’s one suit me too. She has a large and roomy jacket with turned up cuffs to grow in, I have a nicely fitted little jacket with hoodie. But I won’t stole her, no. I will knit one for me sooner or later. Have fun! This is very intriguing and exciting. I can’t wait to see each version. I can’t wait to see your modifications. I tried to do this very thing myself and really did not like the results, especially with the grim-reaper-like hood. But I would love to have a jacket like this and hope to learn a lot from your mods! This is very exciting! I have been thinking about knitting an adult size one for myself as soon as I finish this baby one. Y’all are an inspiration. it is surely exciting. especially since someone has been begging me to knit one since december when i made a little one for her daughter in rowanspun and yorkshire tweed. i am sure it will be an epidemi once you and jared finish yours. if you need more yarn try janettes rare yarn on ebay. she has a good offer on yorkshire tweed. garter stitch is so wool consuming. 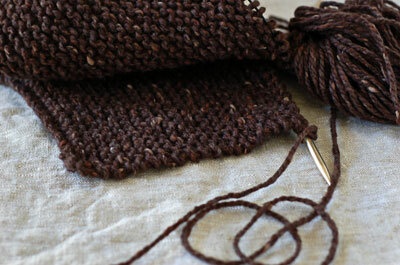 Oddly, I just started an adult tomten too, using my first hand-dyed yarn. I can’t wait to see your progress! 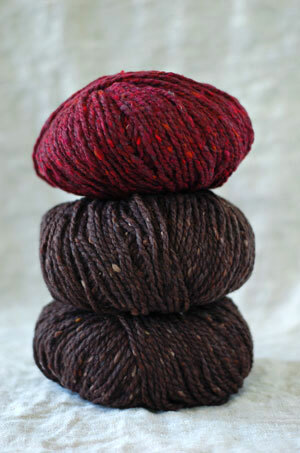 you guys picked fab yarns! Wonderful Project. I too have wanted to make the adult tomtem jacket. So excited to see your and Jared’s progress. What a great project. As always, the more, the merrier! Have fun. I can’t wait to see how it comes out. I’m pretty sure I have a couple skeins of both those colors buried someplace, so if you get stuck on yardage, let me know!